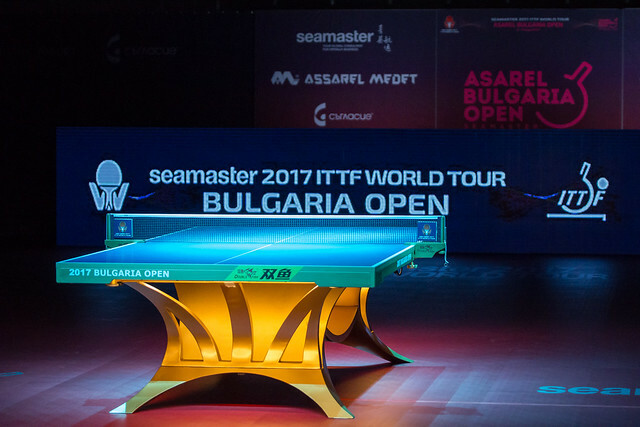 Places in the main draw at stake in both the Men’s Doubles and Women’s Doubles events, brought the qualification tournament that precedes the Seamaster 2017 ITTF World Tour Asarel Bulgaria Open in Panagyurishte to a close on the evening of Wednesday16th August. Furthermore, especially for the men, gaining that precious position was a hard fought experience. No less than five of the eight contests that determined a place in the Men’s Doubles main draw, required the full five games to decide the outcome. Notably Chinese Taipei emerged the most prominent beneficiaries in the hard fought contests. Lin Yun-Ju and Yang Heng-Wei overcame the combination of Nigeria’s Quadri Aruna and Austria’s David Serdaroglu in an engagement that could not have been closer, every match was decided by the minimal margin (11-9, 10-12, 11-5, 16-18, 11-9). Likewise for Chinese Taipei colleagues, Hung Tzu-Hsiang and Tsai Chun-Yu, it was an almost equally tense affair; they booked their place in the main draw courtesy of success against Romania’s Alexandru Cazacu and Rares Sipos (6-11, 11-7, 11-13, 11-5, 11-8). Victory by narrow margins in the deciding fifth game; it was the same for Turkey’s Ibrahim Gündüz and Abdullah Yigenler; they ended the hopes of Hungary’s Tamas Lakatos and Bence Majoros by the very minimal decision (8-11, 11-7, 2-11, 11-4, 12-10). Close calls but no great dramatic recoveries; that honour belonged to India’s Harmeet Desai and Arjun Ghosh as well to the Belarus partnership of Kiryl Barabanov and Pavel Platonov, both pairs recovered from a two games to nil deficits to secure victories. Harmeet Desai and Arjun Ghosh eventually overcame the United Kingdom combination of England’s Paul Drinkhall and Scotland’s Gavin Rumgay (11-13, 8-11, 11-5, 12-10, 11-2); Kiryl Barabanov and Pavel Platonov recovered to beat Sweden’s Harald Andersson and Hampus Soderlund (11-3, 8-11, 11-5, 12-10, 11-2). Meanwhile, in the Women’s Singles qualification event; the determining round for main draw paces, the tension was less. There were two contests that needed the full five games. The Czech Republic’s Dana Cechova and Iveta Vacenovska eventually overcame the combination of Bosnia-Herzegovina’s Emina Hadziahmetovic and Serbia’s Anelia Lupulesku (7-11, 11-6, 11-7, 7-11, 11-7). Likewise, Russia’s Valentina Sabitova and Ana Tikhomirova eventually overcame India’s Ayhika Mukherjee and Madhurika Patkar (1-11, 13-11, 12-14, 16-14, 11-8). Tense contests but in the remaining duels to determine main draw places, times were less testing. In addition, in the Men’s Doubles event, the Czech Republic’s Tomas Konecny and Tomas Polansky duly progressed as did the combination of Sweden’s Viktor Brodd and Hampus Nordberg. alongside the partnership formed by Russia’s Viacheslav and Kirill Skachkov. Similarly, in the Women’s Doubles competition, Chinese Taipei’s Lee Yu-Peng and Tsai Yu-Chin as well as the combination of Turkey’s Sibel Altinkaya and Audrey Zarif of France booked main draw places, a feat also achieved by the Belarus duo of Alina Arlouskaya and Alina Nikitchanka. Success for visitors but alas it was defeat in the preliminary round of the Women’s Doubles event for the host nation. Anelia Karova and Elitsa Zamfirova experienced defeat at the hands of Sweden’s Stefanie Christensen and Daniela Moskovits (11-6, 11-6, 11-6). Main draw places booked; it was the same for the two highest rated pairings in the Women’s Doubles qualification event. The partnership formed by Hungary’s Szandra Pergel and Poland’s King Stefanska received a bye to the main draw as did the combination of Puerto Rican sisters, Adriana and Melanie Diaz.